Randy and Nate Jones’ sailing lobster boat just got greener. Owner/captain Nate, of Westport Island, Maine, and his father, Randy, who co-captains the Sarah Mead, are changing out the 42-foot Friendship sloop’s 20-hp Volvo diesel with an electric turbine, turning what is Maine’s last sailing lobster boat into what the Joneses believe is the state’s only zero-emissions lobster boat. “We think we’re the first commercial boat [in Maine] to go all-electric, other than Navy subs,” says Randy, 58, the retired chief of police of North Brunswick, Maine. The Joneses are refitting the classic 1965 wooden sloop — a type first developed by Maine lobstermen in the 1880s for working traps on Muscongus Bay — with a $5,000 grant from the Maine Department of Environmental Protection’s Clean Marine Diesel program. 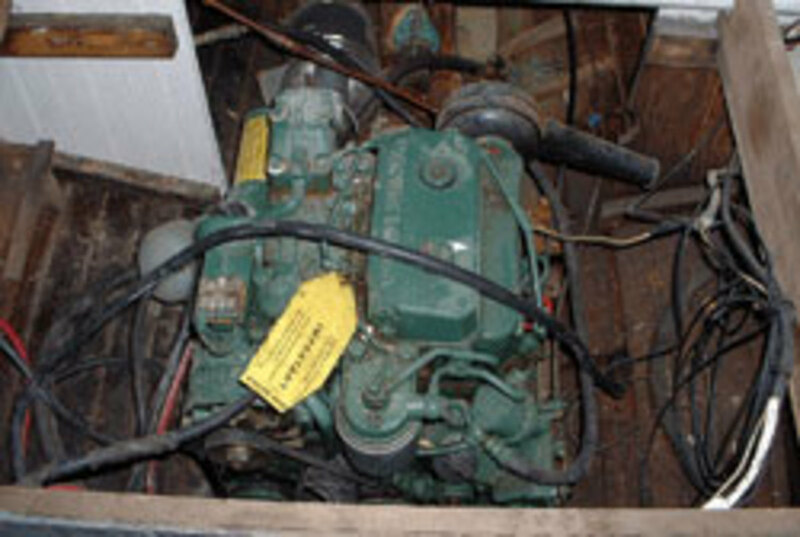 With money allocated under the federal Diesel Emissions Reduction Act, Maine offers fishermen, lobstermen and other commercial operators competitive grants paying half the cost to replace their old dirty, soot-belching diesels with clean, efficient, state-of-the-art diesels or alternative power, such as Sarah Mead’s. Maine awarded grants totaling $1.25 million in federal stimulus money to help repower 53 commercial vessels between June 2009 and September 2011. Since April 2010, the state has awarded another $1 million in DERA grants to repower 29 vessels, for a total of 82 repowered with cleaner engines during the past 3-1/2 years, says Lynne Cayting, of the Maine DEP. 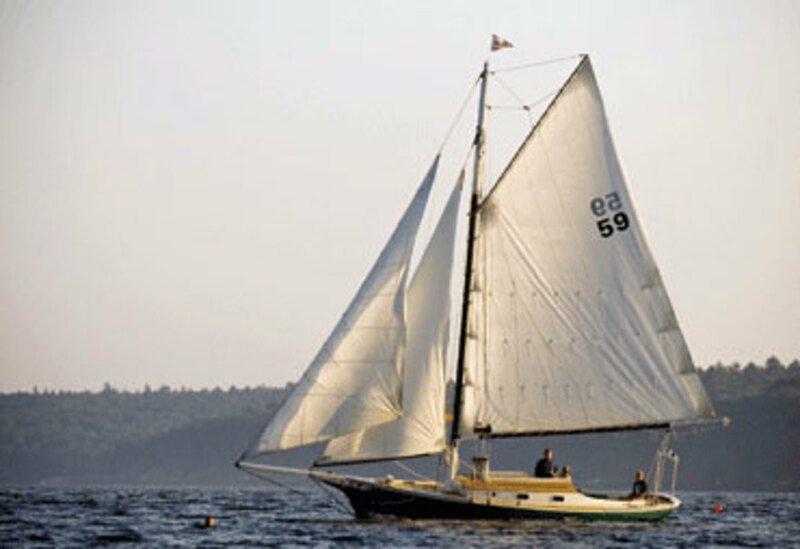 One recent grant recipient is American Promise, the Ted Hood-designed 60-foot cutter that Dodge Morgan single-handed around the world in 1985-86 in what was then a record-setting 150 days. The Maine-based boat’s current owners, The Rozalia Project, which organizes ocean, island and shore cleanup projects in New England, was awarded a $26,000 grant to repower with a hybrid diesel-electric system. The Sarah Mead is a small project for the grant program — Cayting also has awarded a grant to help with a $1.4 million repower of two Portland tugboats — but she says the Freedom sloop repower was an attractive one because it is a kind of demonstration project. For the Joneses, the switch from diesel to electric not only colors their business green but also makes sound business sense. 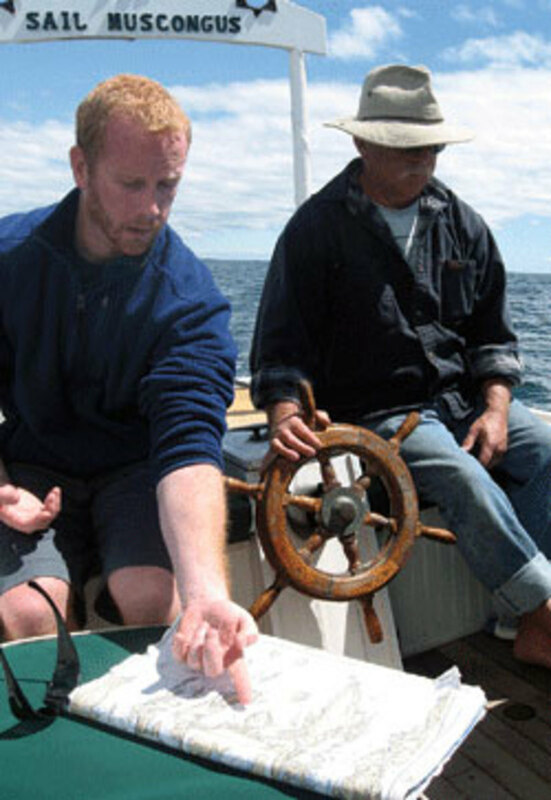 The father-son duo are not primarily lobstermen but tour operators who take passengers on tours of Muscongus Bay — four a day from June to October — on the Sarah Mead. Based out of Boothbay Harbor, they show how old-timers used to tend lobster traps from sloops. The captains pride themselves in using the motor sparingly, usually just for approaching and leaving the dock and in dead air. “I sail way more than I motor, so I don’t think this [repower] will be an issue,” says Nate Jones, 30, who also oysters in winter on the Damariscotta River. 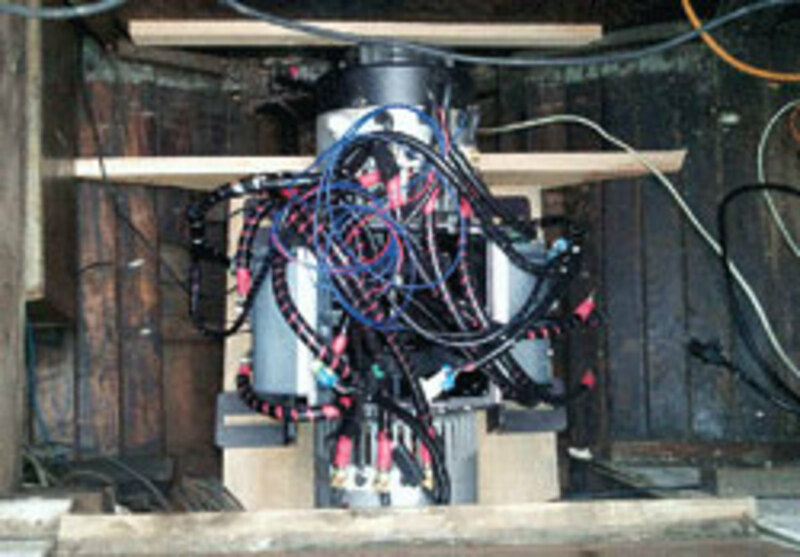 The electric motor, acting as a generator, recharges the Sarah Mead’s eight 120-pound batteries as her prop spins in the water while the vessel is under sail. In a pinch, a generator can recharge the batteries, Nate Jones says, but he doesn’t expect to use it because the lobster boat will be sailing most of the time and recharging its batteries that way. Aside from being clean, green and efficient, the electric system is quiet and odorless — no smoke or fumes. “I can’t wait to see the look on [passengers ’] faces when she pulls away from the dock in reverse and they don’t hear anything,” Nate Jones says. They restored the classic and started running sailing charters in 2006. The Joneses expect the Sarah Mead to be back in service in June, slipping quietly through the waters of Muscongus Bay under sail — and electric power. For more on sailing aboard the Sarah Mead, visit www.sailmuscon gus.com.